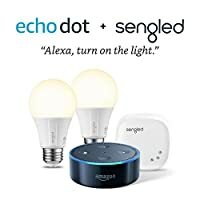 This bundle contains the Echo Dot (2nd Generation) and the Element Classic by Sengled Starter Kit. Connect your smart lights to Alexa for easy voice control. Just ask, "Alexa, turn on the living room light". Control your lights remotely, create routines, or group your lights together with the Amazon Alexa app. Echo Dot includes a built-in speaker so it can work on its own as a smart alarm clock in the bedroom, an assistant in the kitchen, or anywhere you might want a voice-controlled computer; Amazon Echo is not required to use Echo Dot. Alexa is always getting smarter and adding new features, plus thousands of skills like Uber, Domino's, DISH, and more.